BC Khimki Moscow Region survived a thrilling finish to defeat Real Madrid 86-85 for its first victory of the Turkish Airlines Euroleague season. Khimki almost squandered an inspiring all-round offensive performance in the first three quarters. Madrid made an improbable comeback from an 18-point third quarter deficit with 0-16 fourth quarter run, but in the end fell short after Rudy Fernandez’s missed a floater in the final seconds. The results put both teams at 1-1 record in Group A. Kresimir Loncar led six Khimki scorers in double figures with 16 points. Paul Davis scored 15 in 16 minutes of action, while Zoran Planinic had 12 points plus 7 assists. 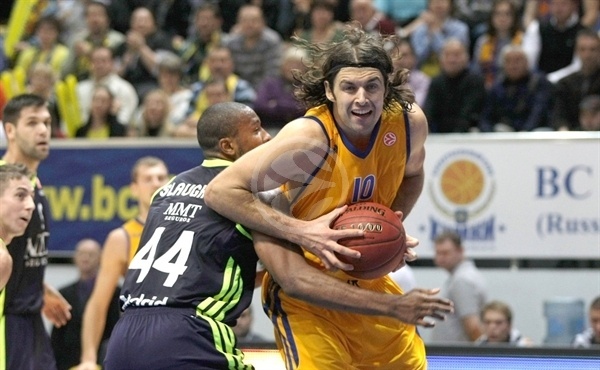 Vitaly Fridzon added 12 in addition to 7 rebounds and 5 assists, K.C. Rivers scored 11 and James Augustine 10. Fernandez and Felipe Reyes paced Madrid with 15 points, Jaycee Carroll added 14, Sergio Rodriguez scored 11 and Nikola Mirotic finished with 10 in defeat. Fridzon scored an uncontested layup and Loncar hit a little hook shot in the paint for 4-0 Khimki lead after 60 seconds. Fernandez hit a three-pointer for first Real's points and Mirza Begic made a dunk on next Madrid possession, but Loncar and Fridzon hit long jumpers to keep hosts in front. Planinic followed it up with 2 free throws and a buzzer-beating three-pointer that gave Khimki 13-5 advantage after only three and a half minutes of play. Rodriguez hit a triple, but Khimki dominated the offensive boards and with Rivers's layup and Augustine's free throws extended the margin to 9 points. Madrid responded with back-to-back alley-oops from Marcus Slaughter and Fernandez, while a fast-break that resulted in a Mirotic layup cut the lead to 17-14. Another triple by Rodriguez made it a 2-point game, but Paul Davis answered with a baseline jumper and a Petteri Koponen triple made it 25-18 after one quarter. Sergey Monya’s wide open three-pointer in the opening minute of the second quarter pushed Khimki’s lead into double digits for the first time and Rivers added a layup on the next possession to make it 27-15. Reyes quickly scored 4 points and Dontaye Draper hit a jump shot to cut the 12-point deficit in half. Carroll capped a 0-8 run with a jumper of his own before Loncar scored an easy layup to make it 29-23. Martynas Pocius’s tough baseline jumper cut the lead to 4 again, but Loncar and Planinic made back-to-back layups that gave Khimki more breathing room and after a timeout, Loncar scored in the low post and Monya on a fast break to make it once again a 12-point game, 40-28 with little over three minutes remaining in the half. After Madrid coach Pablo Laso called timeout, his team’s zone defense enabled fast breaks for Carroll, Reyes and Fernandez that brought Los Blancos within 6 points. In the final minute of the quarter, Koponen hit a jumper and Reyes split free throws to leave Khimki with a 42-35 halftime lead. Fridzon opened the second half with a layup, and after a triple by Rodriguez, Loncar and Rivers lifted Khimki to another double-digit lead, 48-38. The run continued with Davis first hitting a baseline jumper then scoring a tough layup-plus-foul, while Rivers’s three-pointer catapulted Khimki to a 56-40 advantage. After a Madrid timeout, Fernandez and Suarez drove for layups, but Rivers hit a tough jumper and Planinic fed Davis twice in the paint to extend the lead to 18 points, 62-44. Mirotic and Rodriguez quickly netted 5 points, but Planinic and Davis kept having their way in the paint. Planinic’s floater-plus-foul made it 69-51 before Reyes and Carroll each made a pair of free throws and Khimki entered final 10 minutes with a 69-55 lead. The advantage melted to 71-63 in only two and a half minutesafter Carroll made a triple and a layup, and Slaughter stole the ball for an easy dunk. Planinic missed free throws before Carroll hit a three-pointer to make it a 5-point game. Madrid toughened up on defense, forcing Khimki into desperate shots and turnovers, while Reyes completed the comeback – he first put back Slaughter’s free throw miss and then scored a basket-plus-foul on a fast break to give the visitors their first lead of the game, 71-72 with five minutes to go. 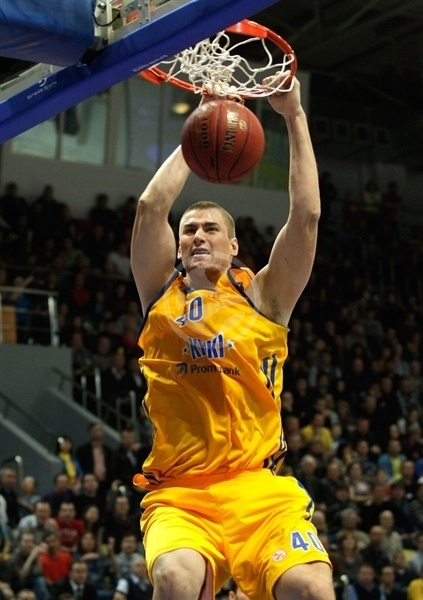 Fridzon’s put-back gave Khimki the lead back, and the teams then failed to score a field goal for more than three minutes. Loncar hit pair of free throws to make it 77-75 and then Augustine hit a tough triple over Reyes’s hand with 1:47 to go. Mirotic missed a triple from the left corner and Loncar kept a steady hand on the charity stripe to extend the lead to 7 points. But Slaughter scored inside to cut the deficit to 5 entering the final minute and Fernandez hit a triple with 37 seconds remaining to give Madrid hope. Fridzon hit both free throws, but so did Fernandez making it 84-82. Fridzon kept his cool again, but Draper hit a three-pointer with 9 seconds to go and Madrid forced bad inbound pass and a turnover from Fridzon for a chance to win trailing only 86-85 with 8.3 seconds remaining. The ball went into the hands of Fernandez, but his floater missed and in a huge crowd Planinic came away with a rebound to secure Khimki’s big victory. "I would like to thank our guys for the courage they showed in the game against a great Euroleague team like Real Madrid. It’s a team with huge history and good selection of players. At the end of the game we were lucky that the our opponent’s last shot didn’t go in. 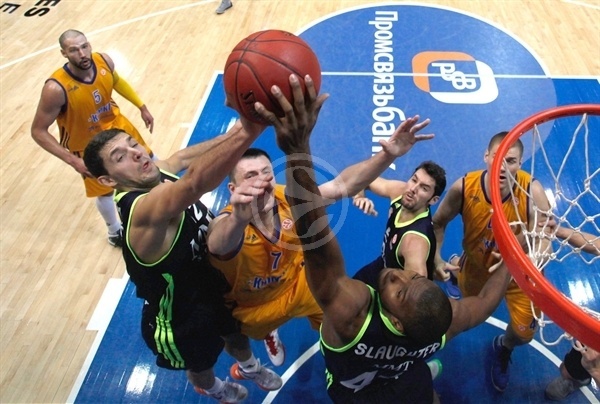 In the Euroleague, we have the plan of winning all the games at home and trying to catch teams on the road. 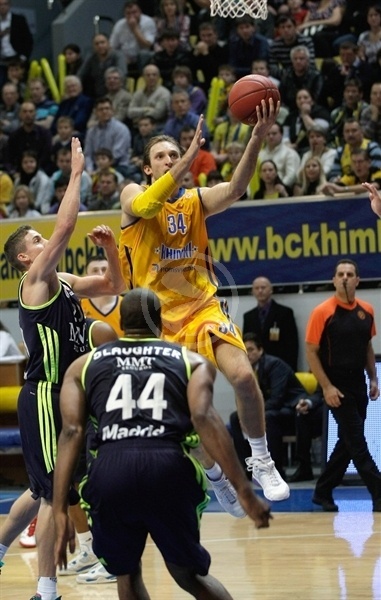 We lost in Turkey, but played a good game, so I can say BC Khimki is on the right track. This victory over Real Madrid proved that we can fight on equal terms with the best teams in Europe." 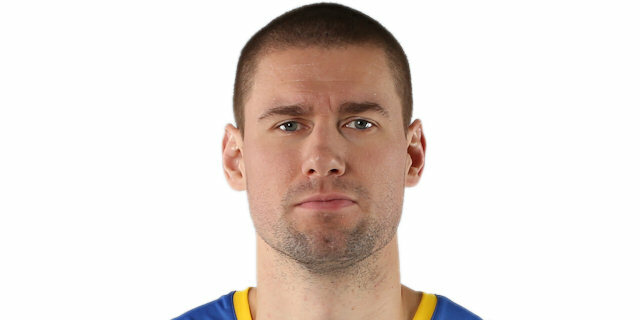 "I congratulate BC Khimki on the victory. Today was some kind of a strange game – our opponent controlled 30 minutes of the game, was in a rhythm, made open shots, scored fast breaks. As for my team, it relaxed. But after the third quarter we changed our mentality, made a comeback and reduced the gap by scoring on some tough shots. We have to play all 40 minutes, but we didn’t. 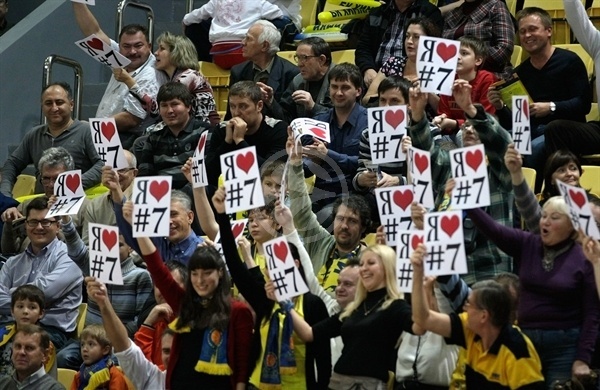 BC Khimki deserves respect; it's a very good team with great players. We knew from the very beginning that it would be a difficult game for us." 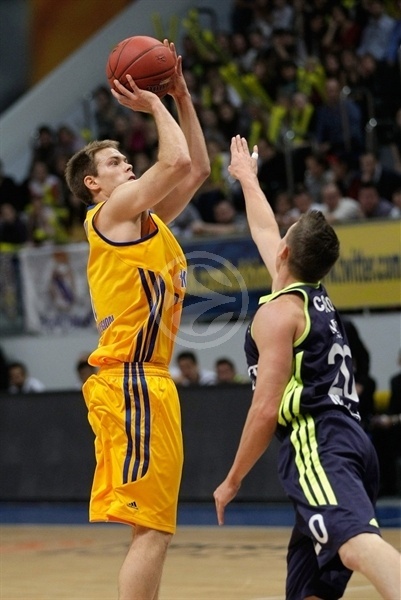 "It was my first Euroleague game ever and I’m happy to have made my debut in such a strong competition. The game against Real Madrid was a big one. To beat them gives us confidence. 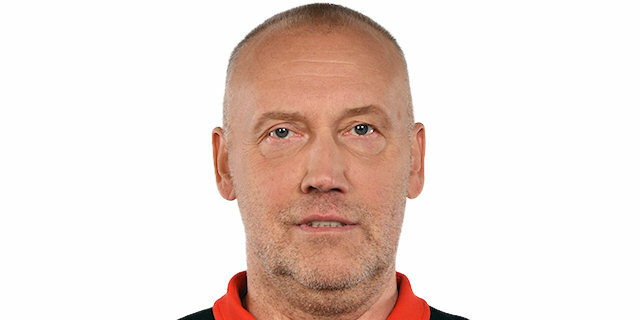 I played against Real many times and know that this team can score 10 points or more in a row in a short period of time and they did that today. It’s a good experience and we’ll try to improve."